Playbooks are downloaded instantly. No shipping, no wait! Spreads the defense out horizontally which creates natural running lanes. Makes the defense defend the QB as a RUNNING threat. Easy to implement run and pass blocking scheme. Series based scheme. Every play sets another play up. Balanced scheme that attacks all areas of the field. 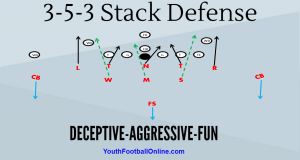 Three formations that are each designed to create alignment conflict for the defense. Easy to install, fun to execute! Parents, players, and coaching will love it. 8 BONUS plays that can be added into the series at any point. The Spread Offense Playbook for Youth Football is fast, balanced, and deceptive. This playbook attacks all areas of field. There are inside, off-tackle, and outside attacking plays. This playbook also features three passing concepts that are very easy to install. This spread offense playbook will allow you to spread the field horizontally, while making the defense have to defend your QB as a running threat. The great thing about this offense is that you don’t need an athlete QB to be explosive. Mobile QBs just add another dynamic element to this offense. Once the playbook is purchased, click the link under Order Details (on checkout page) to download the PDF playbook instantly. This playbook gives you an easy to implement no huddle system (wrist coach color/number scheme) which allows you to control the pace of the game. Going no huddle will also allow you to become efficient play callers. You can call a play that will take advantage of the defense’s alignment. The jet motion attacks the edge of the defense very quickly, and forces them to widen out or get beat. The jet sweep will get your athletes the ball in space very quickly! This spread offense playbook is a balanced playbook. This is a series of plays out of three different formations. Every play sets up another play. There are plays that attack the inside, off-tackle, and edge of the defense. Once the defense loads up against the run, you hit them with the play-action passing plays. This spread offense playbook makes the defense defend the entire width of the field. It spreads the defense out horizontally, which will create natural running lanes. Every play looks the same for the first couple steps. This playbook makes the defense have to look, rather than just attack. Once the defense widens in an effort to stop jet sweep, you hit them inside. Once the defense starts over playing the run you hit them with the play-action passing plays. Formation overview, numbering system, line splits, snap count, jet motion timing, blocking scheme, shotgun snap, player placement, stalk blocking, and a comprehensive no huddle scheme. Run Plays: Jet Sweep, Jet Power, Trap, QB Cross, QB Iso, QB Power Sweep, Reverse, and Beast Formation-Power (goal line play). Pass Plays: Post-Wheel, Post-Corner, Bubble Screen, Sprint-Out Pass, Jet Slant, and 4 Verticals. This playbook is explosive- you will score points. It’s easy to implement and it will give your football team an identity. Fellow coaches, parents, and players will all love this offense. Get this playbook right now. No shipping, it downloads immediately following purchase. I really like this playbook. It’s very well written, covers all of the important details, and seems easy to implement.